Thad Jones, trumpeter, cornetist, bandleader, arranger and composer, was born near Detroit in Pontiac, Michigan on March 28, 1923. He is one of three brothers who have had prominent jazz careers: Hank Jones, the oldest of the three, has had a long career as a master pianist; the youngest, drummer Elvin Jones one of the most influential drummers in the modern era. After Army service including an association with the U.S. Military School of Music and working with area bands in Des Moines and Oklahoma City, Thad became a member of the Count Basie Orchestra in May 1954. He was featured as a soloist on such well-known tunes as “April in Paris,” “Shiny Stockings” and “Corner Pocket.” However, his main contribution was his nearly two dozen arrangements and compositions for the Basie Orchestra, including “The Deacon,” “H.R.H.” (Her Royal Highness, in honor of the band’s command performance in London), “Counter Block,” and lesser known gems such as “Speaking of Sounds.” His hymn-like ballad “To You” was performed by the Basie band combined with the Duke Ellington Orchestra in their only recording together, and the recording Dance Along With Basie contains nearly an entire album of Jones’ uncredited arrangements of standard tunes. Jones left the Basie Orchestra in 1963 to become a freelance arranger and studio player in New York. With former Stan Kenton drummer Mel Lewis, he started a once-a-week rehearsal band of leading studio musicians who needed a creative outlet after the long hours of the then-thriving New York studio recording scene. Armed with only a handful of arrangements, they approached Village Vanguard club owner Max Gordon and were booked for three Mondays in February 1966. This first engagement at the legendary jazz club carried on continuously, gained an international reputation for Jones and the ensemble, and made several foreign tours including a historic 1972 Soviet Union trip. During this time, he also collaborated as an arranger in projects with trumpeter Harry James, and a Bessie Smith tribute with vocalist Teresa Brewer. 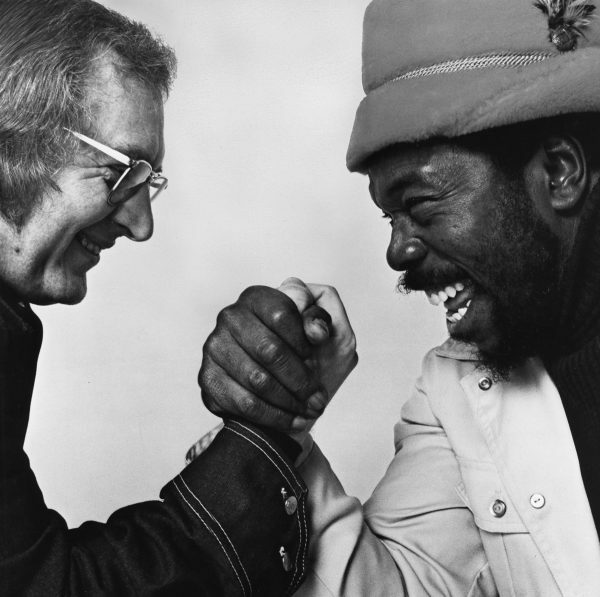 Upon Thad’s 1978 departure to live in Europe, the band continued as the Mel Lewis Orchestra until Lewis’ death in February 1990, and thrives to this day as the Vanguard Jazz Orchestra, still including several Thad Jones alumni, continuing the extraordinary Monday night tradition into its fifth decade. Jones resided in Denmark from 1978-1984, writing for the Danish Radio Big Band and leading his own band. He studied composition formally during this period, as well as taking up the valve trombone. In February 1985, he returned to the U.S. to take the leadership of the Basie Orchestra upon his former leader’s death, fronting the Basie band in numerous tours, and writing arrangements for recordings and performances with vocalist Caterina Valente and Manhattan Transfer. He eventually stopped touring completely, and returned to Denmark several months before his death on August 21, 1986. Jones’ playing was overshadowed by his reputation as a composer and arranger, but the two were inextricably connected. Charles Mingus described Thad as “the greatest trumpeter that I’ve heard in this life” giving an idea of his imaginative style and virtuosity. While with Basie, Jones appeared on several records under his own name and with Mingus, Coleman Hawkins, Phil Woods, Quincy Jones, and Five By Monk by Five with Thelonious Monk. The collaborative album Keeping Up with the Joneses features the three brothers – Thad, Hank and Elvin – along with Basie bassist Eddie Jones, who was unrelated; this four-Jones recording provided the title for Thad’s famous tune “Three and One” that became a well-known big band arrangement later. Other Thad big band pieces also developed in this way, including Mean What You Say, the title song of a quintet recording he co-led with Pepper Adams. Thad’s improvisations in these small groups feature a rhythmic adeptness and an ingenious thematic coherence that are hallmarks of his arrangements. 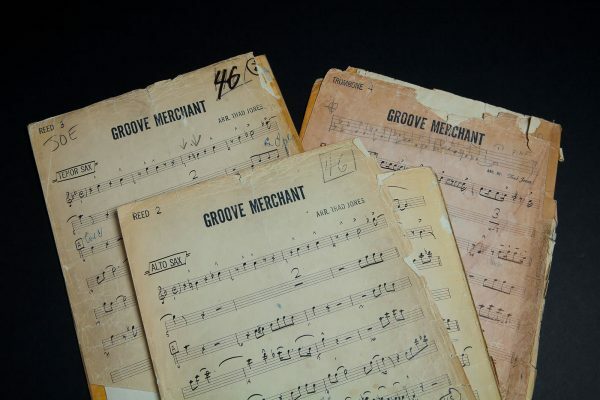 His increasingly inventive charts for Basie were in many cases precursors of the famous compositions he created for the Thad Jones-Mel Lewis Orchestra that have become standard big band repertoire internationally. His works possess multi-leveled qualities that are in common with all great music: they have a challenging harmonic complexity combined with an earthy, bluesy foundation that provides a vehicle for the great soloists who passed through the band. The band was, and still remains the embodiment of a “small group with 16 members.” Thad’s huge onstage presence and his high-energy conducting style urged his players to give their all as an ensemble and as soloists. 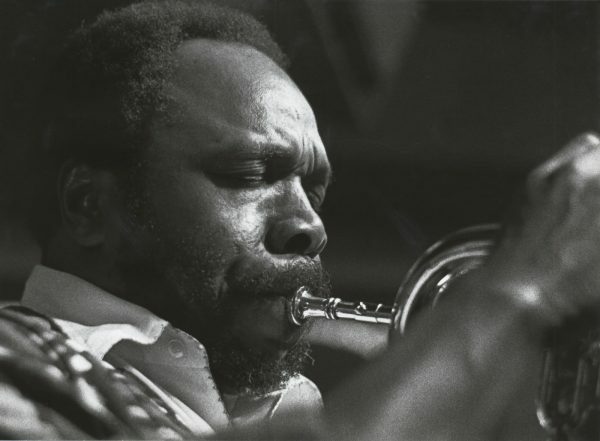 Thad Jones accepted a teaching position on the William Paterson campus in 1972, one of the earliest instances of a prominent jazz musician being offered a full-time professorship. He conducted the big band, taught arranging and other classes until his departure for Denmark. His presence, and the people he drew here created the impetus for the establishment of the international reputation of the Jazz Studies Program. He was awarded an honorary Doctorate of Humane Letters from William Paterson University in May 1978.